Buying solar panels for your RV or camper van is a great way to charge your batteries. Once installed they provide, clean, quiet energy you can use anytime the sun is out. But before going into buying panels and batteries and components, you should consider the best type of solar panel for you. Some solar panel setups are more efficient than others, and each individual install will have different needs to address. In this article we’re going to discuss the different types of solar panels for an RV or camper, the best place to put them, and how many you will need. Rigid panels are solar cells mounted under tempered glass. They range in sizes from huge residential panels to small 50W device chargers. Most panels are mounted in an aluminum frame and designed for extended outdoor use. They are built to withstand hail, sand and wind. The glass is resistant to scratches which is best for long term light efficiency. They are also easy to clean in cold weather because they can withstand an ice scraper. Basic rigid panels are cheaper per watt and generally come with a long warranty (10+ years). Because of their durable frame, they are easier to position towards the sun. Rigid Solar Panels are the best bang for your buck when it comes to performance and durability. Flexible panels are flat cells that are molded with a layer of protective plastic on top. Because they don’t have a frame, they are low profile and can bend to shallow curves such as a van roof. It also makes them lightweight. The softer plastic on these panels is more prone to getting scratches on the surface. However, due to this flexible nature, they are less likely to crack from a large impact. Bending the panels too much tends to cause issues with internal connections and even shorting out between the cells. However this has been improving on a yearly basis in the industry. Because of these issues, the warranty on flexible solar panels tends to be significantly shorter than rigid panels. Flexible panels in general are more limited to sun exposure because they’re not free standing. Their positioning is determined by the surface that they’re attached to. Solar panels work best when the whole panel is getting consistent light. With flexible panels, the more you bend the panel, the less efficient it will be because part of the solar panel will be getting less direct light. If you’re trying to build a stealth camper van, any panels mounted to your roof are going to be a giveaway that someone is living in the van. There are various ways disguise this with roof racks and flush-mounted flexible panels. When you’re living in a van, hiding yourself has as much to do with your location as it does how your van looks. In neighborhoods that are wary of the homeless, just having a vehicle above a certain height will get the cops called on you. Other areas of cities have full Class C RV’s parked in broad daylight and no one blinks an eye. This is all to say that we don’t think that it’s worth sacrificing a lot of effort and resources trying to hide your solar as you may be thinking. If you have solar panels, hiding them helps in only a small percentage of situations. If you’re driving a large camper van or RV, chances are you solar panels will be permanently fixed to the roof of the vehicle. While this is certainly the easiest way to travel, there are circumstances in which you would want portable panels that you can pull out less frequently. You can use portable solar panels or solar suitcases for extra power or to charge small electronics when you’re on the go. 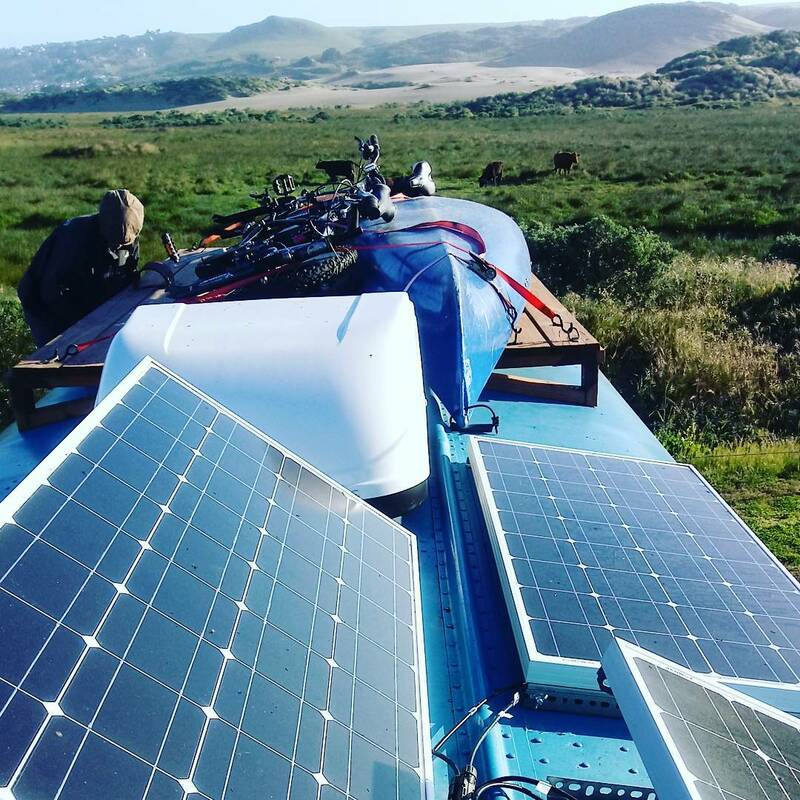 Fixed solar panels are permanently mounted as on top of the RV. You can add tilt mounts to manually adjust the angle and get the most direct sunlight. When planning your solar, be aware that solar panels perform best when cool. It is a good idea to design a gap between the panel and the roof for air movement. Mounting or gluing panels directly to the roof loses important cooling airflow from the underside. This is another reason rigid panels have an advantage over the flexible kind. Most rigid solar panels come with a bit of clearance built within the frame. That should be a sufficient amount of space to keep your solar panels from getting too hot. Better accommodates those who are power hungry and need more than 200W of solar. They are harder to position to get optimum light. Mounts that you can angle help this. 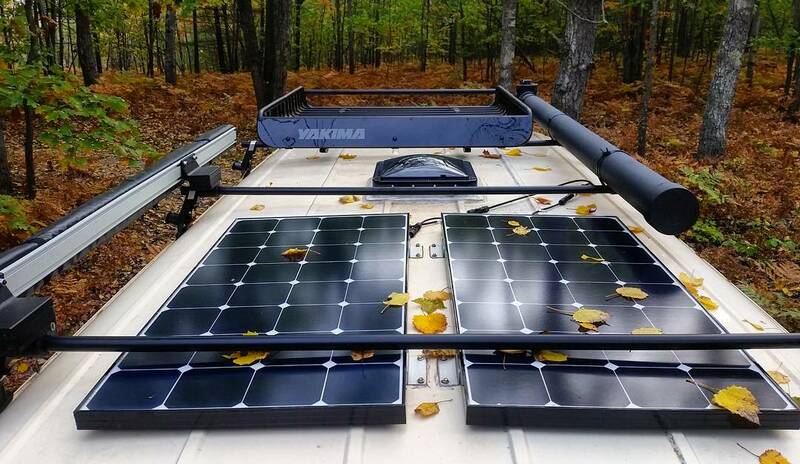 Portable solar panels are used as either standalone units or a portable solar briefcase that you store in your vehicle and then pull out while you’re at camp. These are an excellent choice if your are looking to get a small amount of power like charging phones or a laptop at a campsite. Easier and cheaper for those who don’t have the means to do more custom work. Can position to get the best lighting, opening up options for where you park your van as well. This is what the solar gathering cells of the panel are actually made of. You will hear that one type is more “efficient” than another, but that mostly determines the size of the panel. Once it is in your hands, 100W panel is 100W no matter the technology. Look at the dimensions of the specific panel make sure it will fit and forget about the efficiency. Monocrystalline panels are the most efficient. They take up less space, but are usually a little more expensive. Polycrystalline panels are cheaper and bigger per watt. They share the same longevity and durability attributes as monocrystalline panels. You really can’t go wrong with either option as long as you take measurements and make sure everything fits. Amorphous panels are quite a bit different from the other two. They are significantly less efficient- taking up more weight and space- and are more expensive per watt. These panels are the best in cloudy weather and not as severely affected by partial shade as the other types. These panels are also quite durable, even when flexible, so you can often see them sewn into backpacks and cloth items. How Many Solar Panels Do You Need For An RV or Camper? To determine this, first you need to find out how much power your electronics use. We built a camper van solar calculator to help you size your system. Use the calculator to input each of your electronic devices. It will then give you an estimate of your solar system size, battery requirements, inverter size and charge controller size. You might find that your solar panel needs are too big or too expensive once you run the numbers. This is much better to know in the planning stage than when you’re on the road! You can make adjustments to your expectations or usage until it fits within your goals. Once you have installed a solar panel, weather is going to be the biggest concern (and major headache) when it comes to collecting power. Cleaning your panels is important. Snow and dust can greatly reduce the amount of power that you gather. Be sure to check weekly that your panels are free of dirt and debris. A tilt mount will allow you to adjust rigid solar panels to face the sun directly during sunrise, sundown, and when the winter sun is low in the sky. If you have the budget and space, tilt mounts can increase your solar power capacity by as much as 25%, as long as you adjust them properly. Portable solar panels are already tilt-mount by design! Flexible solar panels cannot really be individually tilted unless you mount them to a frame- effectively making them a rigid panel. Another big thing to know about panels is that most solar tech is very sensitive to shade. Each of the little squares on your panels are wired in a way that if one of them is shaded, the whole row can’t produce energy. Because of this, you can reduce your energy produced by up to 90% if a certain 10% of the panel is covered. This is important when placing the panels and critical when planning the roof layout of the van. If you have a roof rack, chimney or storage box shading your panels you are likely significantly reducing your energy. As with batteries, panels can be wired in parallel or series! What does this mean? Panels wired in parallel run all of their (+) wires into one combiner that plugs into the charge controller. (-) wires also go into a separate combiner. This keeps the voltage the same but increases the amperage going into the charge controller. Wiring in series is where you plug the (+) of one panel into the (-) of another in a long string like Christmas lights. This increases the voltage but keeps the amperage the same. So which way is better? No need for fuses and wiring is simpler and cheaper. Higher voltage rather than amperage means the system is a more efficient. In certain light conditions, series is better. Overcast days or low light situations benefit from series wiring. If panels are only getting enough sun to output 13V, then two panels in parallel won’t be outputting enough voltage to properly charge the batteries at 13.8V. If you’re wiring in series, you’re getting 26V which can be stepped down for a proper charge. Most PWM controllers need parallel wiring. These charge controllers are only rated to a slightly higher input voltage than the battery bank. So if you have two 18V panels and wire in series to put in 36V of power into a PWM controller, you’re loosing anything above the 13.8V that’s going into your batteries. In certain shade conditions parallel is better. If one panel is shaded and the other isn’t, you aren’t loosing as much power because you’re still getting the full voltage from the panel in the sun. Parallel solar needs bigger wiring, fuses, and combiners. Each panel must be fused at the combiner junction in case one shorts out. The wiring must be bigger as you are increasing amps. In our opinion, wiring in series should be the go-to setup due to less complexity and higher efficiency. If you’ve got a small system and PWM controller, then wiring in parallel is better – just make sure you fuse everything properly. To install a full DIY solar panel system you need a few components: solar panels, a battery bank, charge controller, and an optional inverter. Our electricity main page has tips on where to find these items and how to size your system. We’ve put together a few solar panel wiring diagrams to help you get started with your system. Use these wiring diagrams for reference on how to lay out each component. Solar panels are relatively simple devices, so the variation in quality is minimal. Renogy is one of the most well-known manufacturers of solar panels for small applications. One of the best things about their panels is the long warranty. They offer a 5 year warranty on material damage and a 25 year warranty on solar output. They also have excellent customer service compared to other brands in their price-point. Renogy panels are designed specifically for RVs and boats. They are lightweight and have pre-drilled holes for mounting. These panels have a sturdy aluminum base that allows you to use them as either portable panels, or mounted on the roof. One of the benefits of the aluminum framing is that it keeps the solar cells themselves raised off the roof just enough to get a proper air flow. This will keep the panels cooler and increase both their efficiency and lifespan. All of the components that come with these panels – from the junction box to the MC4 connectors – are waterproof. That means you can travel in all weather conditions without fear of system failure. Renogy sells panels in a variety of sizes so you can find a configuration that fits best with your roof. Monocrystalline panels have a smaller footprint than polycrystalline panels. Installing rigid solar panels on your camper van will require a few pieces of mounting hardware and a handful of holes. Fortunately, the process is relatively simple and won’t do a lot of damage to your rooftop. Z-Bracket Mounts are one of the easiest ways to hold your panels in place. You can attach them to roof rack rails or directly on top of the roof. To get a proper seal, place a strip of Eternabond tape beneath the bracket and fill the mounting holes with a dollop of lap sealant before tightening the hardware down. If you’re installing panels on a fiberglass roof: substitute the included small washers with larger ones (known as fender washers) on both sides of the fiberglass to spread the load and prevent cracking. Adjustable tilt mounts can get you better efficiency on the roof, or work as a stand if you are using portable panels. With an adjustable tilt mount, you can install solar panels with or without a z-bracket. Solar cable glands bridge the gap between the roof and the interior of your van. They are small, weatherproof covers that you can run solar cables or other wires through. They can be attached with glue, sealant or screws. Lap Sealant should be used to weatherproof your install. Seal any remaining gaps or holes in your rooftop with this to prevent future leaks. 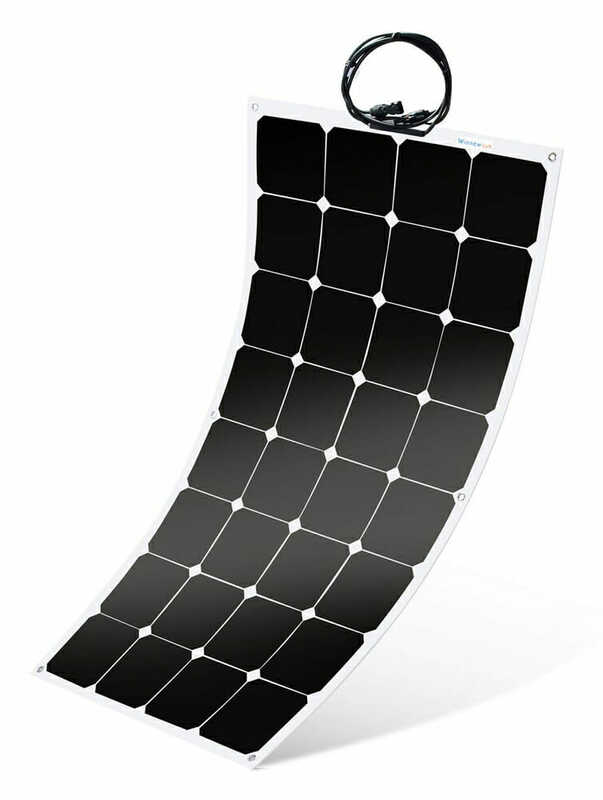 There are a number of brands that make flexible solar panels specifically for campers. Commonly, these panels can bend up to 30 degrees making them a good choice for curved surfaces like teardrop trailers or boats. They are also lightweight and are much easier to install than rigid panels. For the best flexible panels, we recommend ALLPOWERS, Renogy and Suaoki brands. They share many of the same features including a decent warranty, high efficiency, and resistance to extreme weather. With the right materials, flexible panels are quick and easy to install on your camper. They will only require one hole in the roof to run the wires through to the charge controller. To install flexible panels, we recommend using a high strength adhesive like Eternabond tape. Eternabond roof tape is waterproof and weatherproof down to -20°F. This roof seal is made for RVs and sticks to metal, roof flashing and EPDM. Eternabond tape is sticky on one side, so you can run it along all four edges of the flexible solar panel to anchor it down. Alternatively, 3M VHB tape is a weatherproof, double-sided sticky tape that can be placed right on the back of the flexible panels to mount them to the roof. Before mounting, make sure the rooftop is fully cleaned. Remove and debris, wipe it off with rubbing alcohol and let the surface dry completely. The roof tape can be cut to size with a regular pair of scissors. Simply peel and stick. Be aware that these are strong adhesives and will be extremely difficult to remove after its been bonded. Work through the process slowly and carefully. Do not try to cut costs with mounting materials. We have seen horror stories of DIY builders attaching their flexible panels with Velcro only to see them fall off and crack on the first drive. The last step is running the wires to the charge controller inside. This may require drilling a hole in the roof. After running the wires through, cover the opening with lap sealant for a watertight seal. Solar suitcases are an easy way to charge electronics when you’re camping. They often come with their own charge controller and you can hook them into an existing solar set up. Portable solar suitcases typically fold open like a book and have handles making them easy to carry. They often come with their own stand built in which allows you to angle them towards the sun. What is the solar output? Does it come with its own stand? Is a charge controller is included? Does it have a carrying or protective case? The number one thing you should consider is the solar output. Aside from this, a protective case, stand and weatherproofing will likely come down to personal preference and price point. Not all solar suitcases come with charge controllers but most do. With a solar panel and charge controller, all you need is a pair of MC4 connectors and alligator clips to connect them to your battery. Depending on your setup, you can purchase cable extenders which are relatively inexpensive. When planning, remember that there is a voltage drop relative to distance, so more isn’t better. Portable solar suitcases can be installed and connected just like regular rigid solar panels. There are a number of reputable companies that make portable solar suitcases for camping. Our top choices are Renogy, HQST and ACOPOWER. If you’re building a DIY solar panel system from scratch, sometimes the easiest thing to do is purchase a solar kit. Solar panel kits normally come with panels, mounting hardware, connectors, and a charge controller. Generally not included is the batteries, inverter, and wires. Bundling these items together can ensure that all of the components work together seamlessly. The most efficient kits come with MPPT charge controllers and monocrystalline panels. Budget solar kits generally have polycrystalline panels and PWM charge controllers. The difference in solar panel type is the surface area. 100W is 100W no matter what type of panel you buy. Monocrystalline panels are slightly more efficient so they will take up less space on your roof. That said, with the advancement of technology solar efficiency is between these two types of panels is negligible. They both work effectively. MPPT charge controllers are more efficient than PWM. However, due to the way solar scales, the difference between the two does not favor the MPPT controller until systems over 400W. You can read more about this in our post on charge controllers. After you decide how many solar panels you need, choose a kit that is sized correctly for you. WindyNation is more popular with the RV community. What we like most about their solar kits is that they come with battery upgrades. This ensures that all of your components are designed to work together without having to worry about incompatible components. While their solar kits do not allow you to upgrade the charge controller, we think the kits are a great value for someone new to solar and the easiest way to get your system up and running. Renogy makes a large selection of solar panel kits. They are one of the most popular companies for van lifers and offer different sizes and upgrade options. You can pick the solar panel type, charge controller type and choose kits that come with more or less components. One of the things to pay attention to is whether you’re buying a starter bundle, or a full RV kit. The starter bundles normally do not come with mounting brackets or connectors. They have the bare minimum of components and are the cheapest. Renogy RV kits come with pretty much everything you need except the batteries. One of the things we like most about Renogy is their straightforward instructions. Their kits come with simple wiring diagrams that lay out all of the components and they have excellent customer support to help you connect your system. Installing a solar panel kit on your camper van or RV should follow the same steps as installing rigid solar panels listed above. Before closing out, we’d like to give a quick mention to solar generators. Generators like the Inergy Kodiak or Goal Zero Yeti are essentially a solar system in a box. They come with all of the components necessary to build a solar system including a charge controller, inverter and battery. All you need to install are the panels. Solar generators are the perfect solution for someone who doesn’t want to get deep into wiring and system sizing. They are plug-n-play boxes that are safe and require little to no DIY solar power knowledge. While solar generators do cost more than building a system on your own, they are nearly impossible to mess up and are fully portable for camping and travel. If you don’t want to worry about wiring, we recommend reading this post on solar generators. This is fantastic. It sums everything up, and answers all my current questions about solar. Thank you! Charging with alternator will give you more power than most solar setups. So, no, definitely not needed. When solar is great is if you’re stationary for a few days! Just a heads up, I think the last line of the first bullet point under “Wiring in Parallel” should be parallel not series, as you covered wiring in series prior. Thank you for the very informative article! Keep up the great work. Mark- we certainly worded that in a weird way. Thanks for the heads up! Hi Kate & Ian, is this correct??? >> I saw a video where a solar guy said if you’re running 2 or 3 x 100 watt panels for example, and add one more smaller, say only a 50 watt panel, then ALL of the panels would only be able to output the lower amount (in this example they all become 50 W each). Is he correct and why? Or would that depend on whether they’re wired in series or parallel? Super article thanks!! Thanks a lot for your excellent article. I think flexible solar panels are much lighter than conventional solar panels, which makes them suitable for different applications. Flexible solar panels can be folded or rolled up, which makes them portable. The major advantage of flexibility is that these panels can be integrated with all kind of shapes. Am I right dear? Such an informative write up. Solar energy/panels are appreciated more by many people nowadays because of its benefits and usage variety. Thank you for sharing this. Thanks for writing this detailed guide. My partner and I used to travel in a camper van in the US for three months and then in New Zealand for a month. I would have loved to have a solar panel installed back then. Hopefully, we can on our next trip! Will be saving this as a reference. Great to hear! Let us know if there are any subjects that you want to know more about and we’ll put them on the calendar. Thank you for sharing an informative blog which is interesting to read. Here You described in detail about solar panel which will increase awareness of solar energy to everyone. Yes, if it has all week to charge solar should be plenty to charge your battery for the weekend. You might also want to look into the Cole Hersee battery isolator because they have options that work with the new smart alternators.